Inexpensive dorm supply that has many uses! Dorm Co. Tip: An easily forgotten essential! Buckets can be quite handy in your college dorm room but who wants to try and fit a full-sized bucket in their college dorm room? You’re already limited in your college closet space, who wants to store a big bucket? Our compact and collapsible 5 liter Collapsible Storage Bucket - Yellow solves that problem while still being great for all your dorm needs when a bucket could really come in handy. Buckets are perfect for cleaning dishes quickly and conveniently (in case your dorm room doesn’t have a common kitchen area), hand washing delicates in a private tub, washing off dirty shoes without taking them to a public bathroom or dorm shower, cleaning up messes or spills or cleaning your dorm room, great for carrying supplies to on and off campus activities, or even for catching rain drops when you find yourself with a leaky roof. There are a multitude of ways that your dorm bucket can be used in your college dorm, and when you’re finished using it, collapse it and slide it back into your dorm storage. 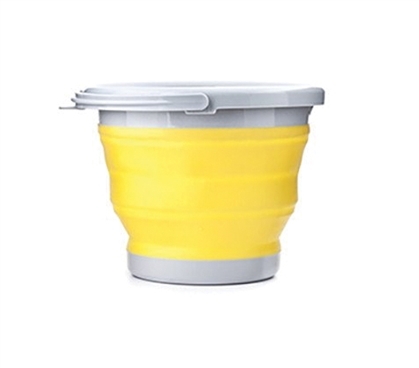 A dorm bucket’s versatility makes this an unlikely dorm essential, but our durable silicone dorm bucket is a surprisingly versatile dorm necessity.